McIntosh takes particular care and attention to the performance, ergonomics and quality of our all our products. Nowhere is this more evident than in their Preamplifiers. McIntosh's Audio and Video Preamplifiers are exceptionally easy to use, even in a darkened home theater. Their feel and familiarity immediately invite you to explore your McIntosh System, significantly enhancing your ownership experience. The new McIntosh D-100 is an exciting piece of equipment in which it has been designed with the "modern" audiophile in mind. It features no analog inputs at all, however D-100 preamplifier offers a total of five digital inputs all running thru an ultra-sophisticated 32-bit/192kHz DAC's including USB, Optical, and Coaxial Digital connectivity. The McIntosh D-100 is also very flexible as it can be a simple solution to add digital music to an existing McIntosh audio system, allowing upgrading without having to replace your current McIntosh preamplifier or integrated amplifier. Or you can simply assemble a new system by simply adding a power amplifier and a pair of loudspeakers, as the D-100 offers both fixed and variable audio outputs. Connect your digital sources, such as a CD player, or a music server streaming lossless FLAC files directly to your power amp. 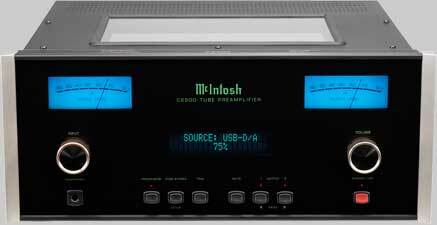 The McIntosh D-100 utilizes a powerful DAC Audio Engine that features an eight channel 32 bit, 192 kHz D/A converter. This type of audio processing power will deliver a wide dynamic range, with extremely low distortion that normally would be unheard of from other designs. The eight D/A converters used in the D-100 are what McIntosh calls in "Stereo Quad-Balanced Mode", all your music is reproduced with excellent sound staging, imaging, and musicality. The effect will be very prominent, and it will make you feel that you are experiencing your favorite recordings for the very first time! The McIntosh D-100 is on display at The Stereo Shop, demonstrating thru a server streaming lossless music files, running thru a complete McIntosh audio system and loudspeakers. Come on in soon and allow us to demonstrate just what is possible with the new digital preamplifier that McIntosh is now offering, and what it can offer you to easily and fully enjoy all of your favorite music! The new C-2500 combines McIntosh’s legendary vacuum tube preamplifier circuitry, and sound quality, while featuring a full set of exciting and modern features and functions. The McIntosh C-2500 preamplifier offers a full complement of six dual triode vacuum tubes to ensure the finest level of musicality of all of your music sources, and even playback of your treasured vinyl recordings. Offering the romantic sound quality of tubes, the McIntosh C-2500 boasts the highest measured performance of any single chassis McIntosh tube preamplifier. With a total of eight high level inputs, two dedicated phono inputs with both Moving Magnet and Moving Coil that are both adjustable, and five digital inputs, makes for an extremely flexible preamplifier which will allow you to assemble even the most complex of two channel audio systems. The digital inputs, two coaxial, two optical, and one dedicated USB Audio all run thru a powerful McIntosh Digital Engine that are sent thru a 32bit/192 kHz DAC to provide a sound that will astound you with its musicality and accuracy while maintaining the classic McIntosh sound that you come to expect. 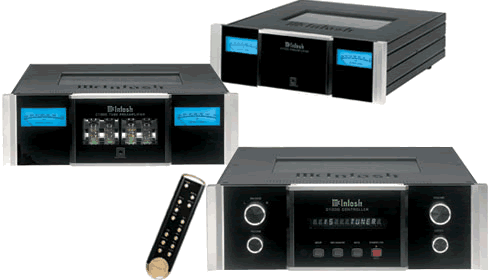 Connect your CD player, your lossless FLAC files on your server thru the McIntosh C-2500 and you will be amazed with the difference of sound quality, all without the need, and complexity of adding on add-on digital decoding boxes! A total of eight high level inputs, two dedicated phono inputs with both Moving Magnet and Moving Coil that are both adjustable, and five digital inputs, makes for an extremely flexible preamplifier which will allow you to assemble even the most complex of two channel audio systems. The front panel of the McIntosh C-2500 is a sight to behold with its beauty and level of craftsmanship with the classic look of its silkscreened glass front panel backlit with modern fiber optic lighting permits you to easily read and operate the C-2500, and allows its beauty to be admired for many years to come. Also highlighting the C-2500’s front panel is the characteristic McIntosh blue VU meters that completes its appearance. The inverted stainless steel chassis with the C-2500 delivers both form and function, by keeping the sensitive analog circuitry isolated from the digital circuits, delivers a level of performance of separate audio components in a simple, single chassis. And with McIntosh’s new High-Performance Headphone Amplifier section will easily drive and transport you with a totally new level of headphone listening experience and enjoyment. The McIntosh C-2500 preamplifier builds upon their vast knowledge and expertise of manufacturing some of finest sounding components, while including modern technologies that will bring the utmost musical enjoyment, and be a preamp that you will be proud to own for many years to come! With unprecedented flexibility and control, the McIntosh C-48 redefines what a preamplifier should be! McIntosh C-48 offers more exciting new options while maintaining the traditional McIntosh preamp functionality. These engineering enhancements combined with smart, user programmable features to deliver a truly powerful and emotionally engaging music listening experience. Most stereo preamplifiers are designed to work primarily with analog music sources, the McIntosh C48 preamplifier continues to deliver world class analog performance, as well as, all of your digital sources as well. The McIntosh C48 has four high performance digital audio inputs so you can connect your CD player, or Airport Express to send music wirelessly to your McIntosh system. There are also eight analog inputs, including a phono input for either moving magnet or moving coil cartridges. McIntosh’ proprietary USB digital audio input allows music that is downloaded, ripped from CD, or streamed from a music service or internet radio to be enjoyed on your home audio system. The McIntosh C-48 features advanced digital decoding to utilize the latest 32 bit/192kHz Digital to Analog conversion. All the digital data is asynchronously re-sampled up to 32 bit/192kHz making the data independent of its source and jitter free, resulting in superb analog sound quality from digital sources, and USB source data rates to 32 bit/192kHz is supported. The designers at McIntosh were careful to separate all the digital circuitry and power supplies from the analog circuitry (digital is mounted below the steel chassis, and analog mounted above). This separation allows the electrical shield of steel to enhance the C48 performance close to that of a two chassis preamp design. The McIntosh C-48 also includes a five band tone control that allows you to tailor your music to your personal taste, as well as, the ability to not only to adjust by input, but also the option to bypass its tone control also. 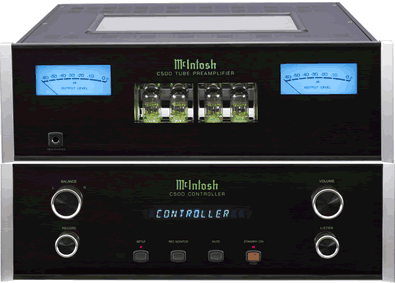 With its excellent sound quality, superior connectivity, all in a beautiful and easy to use component, the McIntosh C-48 is a very musical preamplifier you will find very gratifying, and be proud to own for years to come! Dimensions Height, 6.0", X Width, 17.5i", X Depth, 18.0"
Now you can get spectacular sounding music in both the Digital and Analog musical worlds with the new McIntosh C-50 Stereo Preamplifier. The McIntosh C-50 offers more flexibility and performance capabilities than any previous McIntosh preamplifiers. Notably, where most stereo preamplifiers are designed to work primarily with analog music sources, the C-50 preamplifier continues to deliver world class McIntosh analog performance while dramatically enhancing contemporary digital sources as well, such as music stored on a computer hard drive. McIntosh' proprietary USB digital audio input allows music that is downloaded, ripped from CD, or streamed from a music service or internet radio to be enjoyed on your home audio system. The McIntosh C-50 features advanced digital decoding to utilize the latest 32 bit/192kHz Digital to Analog conversion. All the digital data is asynchronously re-sampled up to 32 bit/192kHz making the data independent of its source and jitter free, resulting in superb analog sound quality from digital sources, and USB source data rates to 32 bit/192kHz is supported. The McIntosh C50 also has four high performance digital audio inputs so you can connect your CD player. The designers at McIntosh were careful to separate all the digital circuitry and power supplies from the analog circuitry (digital is mounted below the steel chassis, and analog mounted above). This separation allows the electrical shield of steel to enhance the C50 performance that is very close to that of a two chassis preamp design! The very functional and transparent Eight Band Tone Equalizer is truly useful for customizing the sound to your personal preference. You also have the ability to deploy or bypass the equalizer by input selection also. Aesthetically, the McIntosh C-50 is as beautiful to look at it is to listen to! The beautiful and timeless "McIntosh Blue" front panel meters on the C50 allow monitoring of output level. Also the McIntosh C-50 features a hand fabricated, polished stainless steel chassis, and topped with a beautiful top glass cover. This preamplifier will leave you spellbound with its beauty, and sonic performance, but you'll also appreciate its exceptional build quality that only the craftsmen at McIntosh Laboratories could provide! The new incredible sounding McIntosh C-500 preamplifier uses two separate chassis to keep noise from entering the delicate preamplifier circuits; this is a no-holes barred design. supply, microprocessor and control circuits from the pure audio circuits for total noise isolation. To further aid in channel isolation the circuitry for both channels is totally separate, physically isolated and shielded. The C500 incorporates two identical power supplies one for each channel, to help assure total channel isolation. This dual-mono preamplifier is available with your choice of either solid-state or vacuum tube electronics. There are separated dedicated moving coil and moving magnet phono stages for your turntable that are fully adjustable with either the front panel controls or the remote! The volume control is a balanced design that assures accurate volume tracking and extremely low noise. This is a preamplifier that will provide you with the utmost musical performance and give you enjoyment and pleasure for many years to come! The debate over whether tubes or transistors sound better is still going strong after forty years. McIntosh has led in both technologies, and has just raised the bar again, with the C1000, The C-1000 is a three-chassis design that offers the ultimate in flexibility. It lets the listener choose between a solid-state preamplifier, vacuum tube preamplifier, or both. All three modules can be combined with each source available through either preamplifier module, selectable at the push of a remote control button. For ultimate stereo fidelity the preamplifier modules employ Dual Mono topologies yielding over 130 dB of channel separation. The C1000 Preamplifiers with a Controller are the finest audio preamplifiers McIntosh has ever created. No design compromises were allowed in the quest for a preamplifier, both Solid State and Tube with absolute accuracy, total sonic purity and virtual elimination of distortion and audible noise. For those who have been searching for the "Best in Preamplifiers", your wait is over.